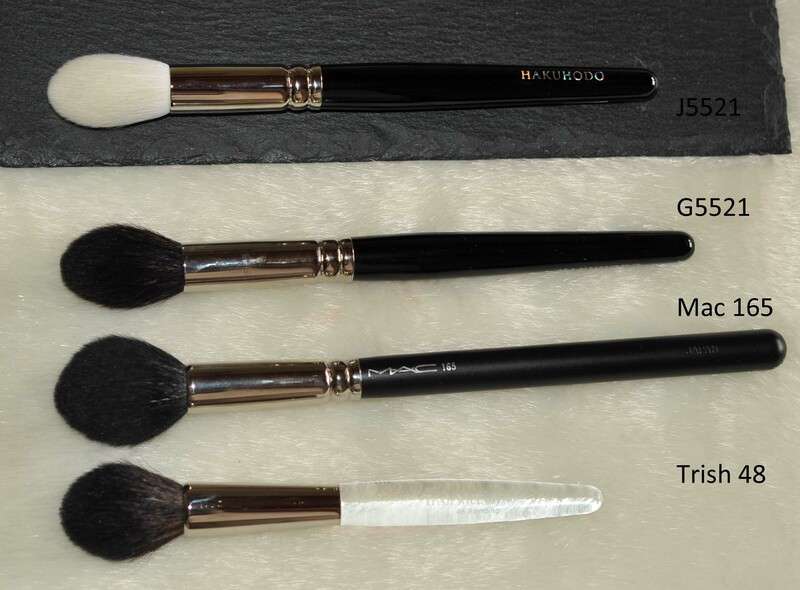 You may already know that Hakuhodo has just released their new J series, I was really deeply wishing that their current range had more white goat brushes, imagine my surprise when I heard about these J Series ! Today I have received my first order that was placed the same day the collection has been released. 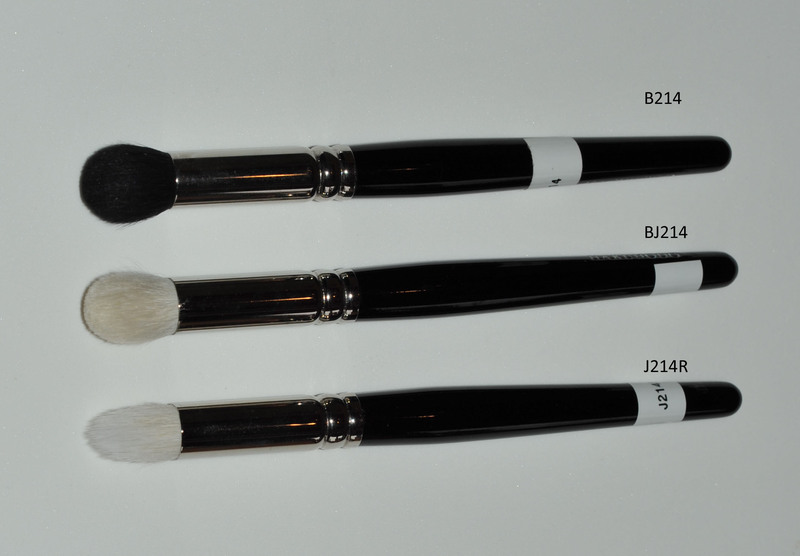 I didn’t take great photos but I just wanted to quickly show you the ones I ordered and compare them to some familiar brushes, maybe this will give you a better idea of their size if you were planning to order them. They will certainly be used very very often ! 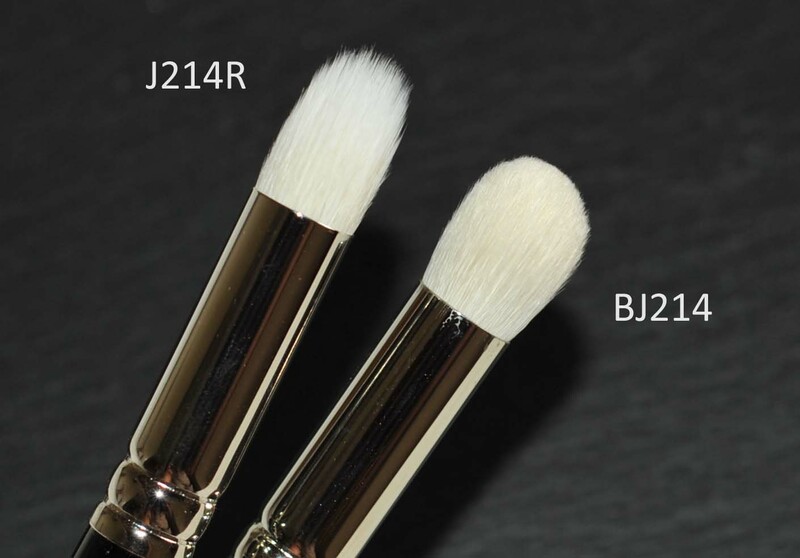 The J214 is really dense and soft, the goat and synthetic is less dense but seems fantastic for cream shadow, concealer, etc.. both are must-haves ! Extremely soft, a perfect and nice little shape ! Since it’s very thin, I wonder if it will pick the same amount of powder as a Mac 239. Thinner than the Mac 217, but it hasn’t been washed yet, maybe it will expand. I thought it would be similar than the Mac 239 but it’s way bigger. Great quality though. Extremely soft ! Another must-have..
You need this… extremely good quality and just an absolute must have. Very similar to the Tom Ford, I need to try this one tomorrow…, again very curious to see how it performs because the quality seems as good as the Tom Ford, just the handle is different. 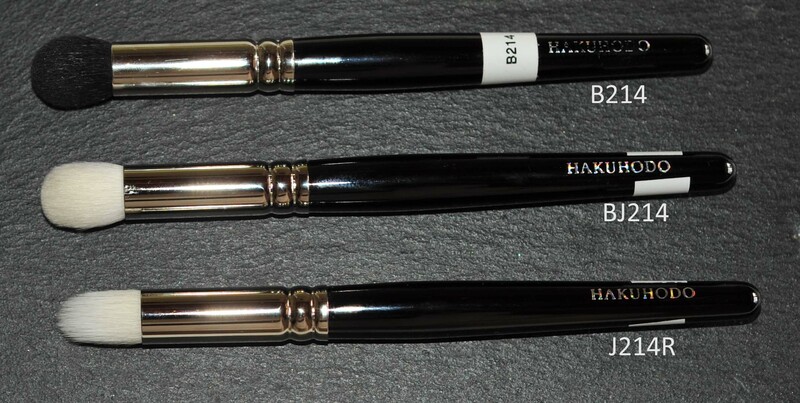 A gorgeous brush, I am so surprised to see the value for money you get with these Hakuhodo ! I am a bit sad that the numbers are not engraved on the handles so I like to stick labels with their number. I am very impressed with my friend Dena, she can remember the numbers of the brushes !!! Well, this is quite unexpected, I made my second order on Saturday and today, 4 days later it’s already here… I have chosen the shipping option at 12$ for Europe. Not disappointed, so far great value for the price but I haven’t tried them yet… can’t wait ! 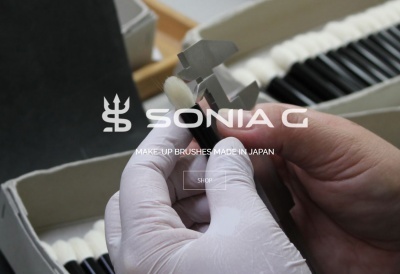 Hakuhodo J Series – First pics – updated was last modified: August 18th, 2013 by Sonia G.
They are very different, I do recommend you both 214 and 214R ! 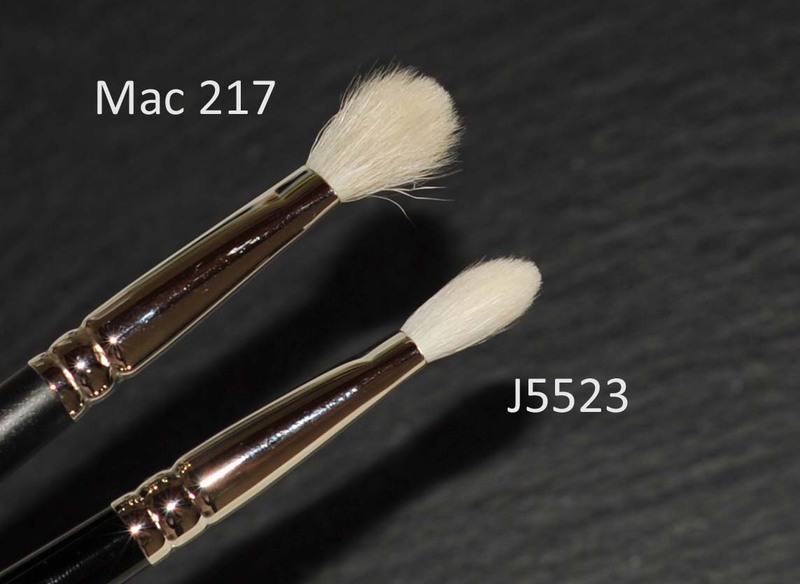 I’m waiting mine too 🙁 J214R will be in my second order, I was afraid it would be as big as the 214 (I have the black goat one and it is too big and too stiff) I’m glad I ordered two angled brushes (J122R and J125) as the J515 (which is similar) seems excellent for applying shadow on the lid and blending. I’m waiting for the J5523 to be back in stock to make my new order but now, I don’t know if it will be as multipurpose as the mac’s one. I’ll wait for your review. 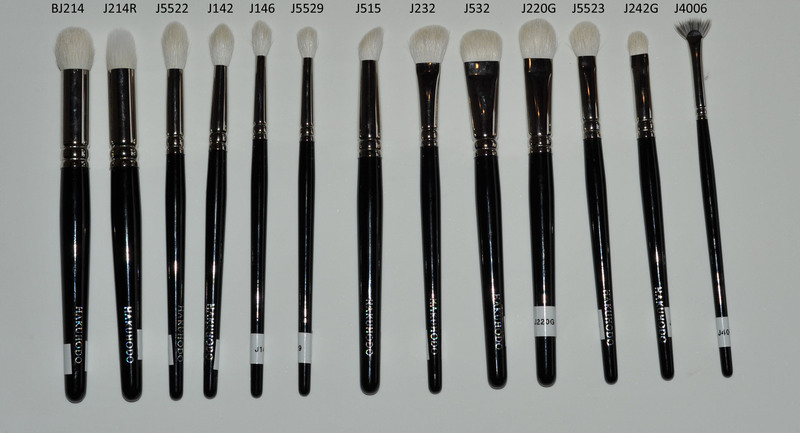 I wish they have made an equivalent for the G5524 or the G5527 🙁 I wonder if someone has ordered the face stippling brush, it was one of the brushes I really wanted but my experience with the koyudo one made me a little hestitant. The J214 is softer definitely, but my B214 doesn’t feel scratchy. Me too, I wish they also had the G5524 and G5527 ! I have ordered it, I am waiting for it 🙂 Will let you know when it’s here ! Hi Nikoleta, I would love to hear what you think of the J122R, J125 and J515, and what the differences are. I haven’t received my order yet, but I am already getting ready to place another one! 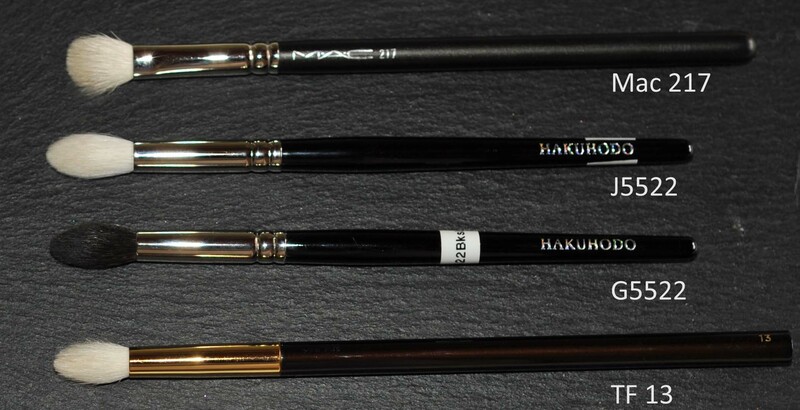 Hakuhodo is so MEGA efficient & the brushes look fantastic – perfect Hakuhodo quality as always! Oooooh….I especially like the look & size of the J220. The J214R also looks interesting. I CANNOT get friendly with the B214 though. It is soooooo thick and dense. I must be doing something wrong. How do you girls use this thing? ?When I use it I feel like I’m trying to wedge a sausage into my the crease of my eye. You will love the J220 !!! Eeeeeeeee….my poor innocent little mushroom being held captive & molested at customs!!! I’ll give the B214 another try but I would think that it is so dense that it would work more like an eraser & remove all the shadow I had carefully applied:) I’ll use a specially light hand. I wondered how the J5529 compared to the tom ford one, You’ve read in my thoughts, Sonia 🙂 Wich brush did you order ? I thought you had both the G5524 and G5527. The 5524 is HG for me now, it doubles the 514 but is way softer and less dense. I didn’t order the J515, Dena, as it is too “angled” but as soon as I have my order I’ll send photos to Sonia if it is OK. I have the G513 though and judging by it’s quality I think the goat ones will be perfect for blending and lid application, nose contouring, concealer. That’s way I’m not sure I really need the G5523. Did you use it, Sonia, is it a better alternative to mac? I ordered the stippling J4001, I wanted a similar stippling brush for a long time but I was waiting for the “one”. I don’t know how this will perform but I have good chances to get a good one with Hakuhodo. Yes I confirm you need the G5523, it’s fantastic ! I finally tried some of them today and I love how they pick the powder and how they blend, to me they are perfect brushes. argh, beautiful beautiful brushes… totally in love with them. I will give you more info tonight, I have an appointment and have to rush outside but I’ll be back with more info.. 🙂 In total I made 3 orders, I certainly don’t need all of these but I just love white brushes and these happen to be so beautiful ! 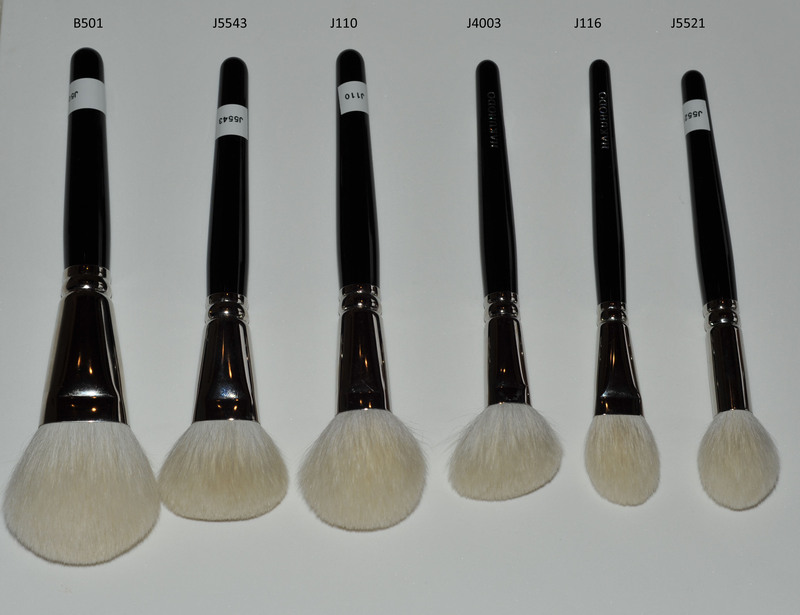 So, the brushes I got other than the ones already pictured above are J122R, JP12, J524, J528, J5533, J4001, J4004, J4005. Today I took some more time to see what I needed replacing or upgrading and theses are the ones that were initially concerned. I need a flat brush like the JP12 for tight line, the Trish is too hard and I am in fact looking for a “thicker” and softer tight line, I also needed some more for cream shadows, the angled concealer, and the stippling is one that I was looking for, I researched in other brands (Chanel, Trish, etc) and wasn’t really convinced. I also wanted an eyebrow brush, I like the Inglot I am using but it’s really huge and I also wanted something a bit more precise. The J528, well, I had the similar Kokutan in my shopping cart for almost a year and never decided to get it, now in these series it’s less expensive and I will be more happy since I can use it also with cream products…. I have to wash the face brushes and see how they work, I have to say I am very pleasantly surprised with them, although you can see it’s not the same handle quality as a Tom Ford, the bristles are fantastic quality, and the shape of the ones I got are just exactly what I was looking for ! My shopping cart just added few more brushes after your ‘intoxicating’ post! I received my brushes today (Shipping with tracking) and they just had their bubble bath. I am going out of town for 2 days so by the time I get back they will be waiting for me.. yay..! I also received my RMK cheek colors today. I took some pictures but haven’t really swatch them yet. Not sure if you will like it though cos the cream one has more sparkles/shine in them. I will do a proper swatch when I get back. So you got the Koyudo ?? fantastic !! No, Sonia, I got my Hakuhodos! 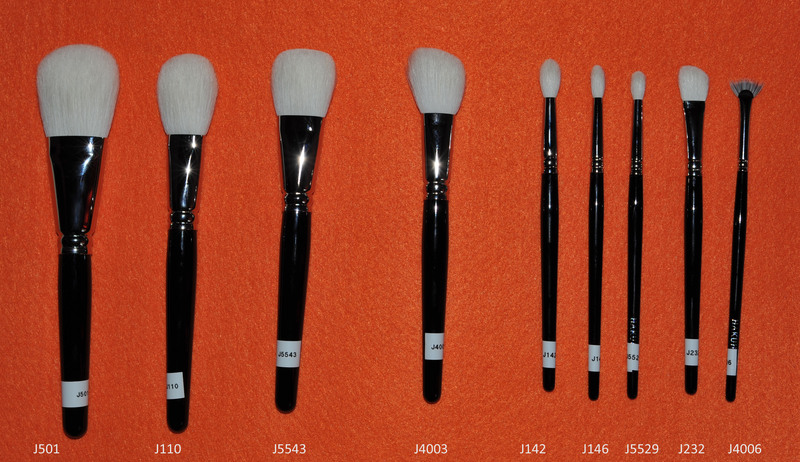 I placed an order for J4003 and J4004 from the J series, and 5 other brushes from other series. Also got a misty set for my mom’s birthday next month. She plans to do a lot of traveling in the coming months so this should suit her perfectly. I really love the J4003, it is dense and soft. Can’t wait to use it when I get back! They are really nice and worth it ! Loving them ! You REALLY deserve a holiday now !!! After working & blogging FULL time for weeks & months you MUST take some time out now & enjoy relax time with your very understanding man:)) Just pretend I’m your mommy OK?! Get there safely & then RELAX ok?? Actually I will be leaving tomorrow, chances are under the rain and the max temperature will be 7 degrees here… Hope the destination weather will be a bit less cold and wet than here… ! Will also be connected at the destination !!! I’ve just received my J122R and J125, they are exceptional. I think I’ll take all the J125R too and a J5523 but it’s still out of stock 🙁 I’ll take pictures this weekend and send them to you. so… were you able to control yourself or did you go crazy ??? Hi sweetheart 🙂 I went mental! And i mean METAL! After the disaster that was Claudio Riaz i knew from past experience that i would like these so i ordered a small fortune! Hopefully they will be hear early next week – super excited! I bet you went 🙂 I saw the ones you got at Imats and I have never been so excited about a brush collection ! I have been using them for just a little while but I am surprised every day with their versatility. 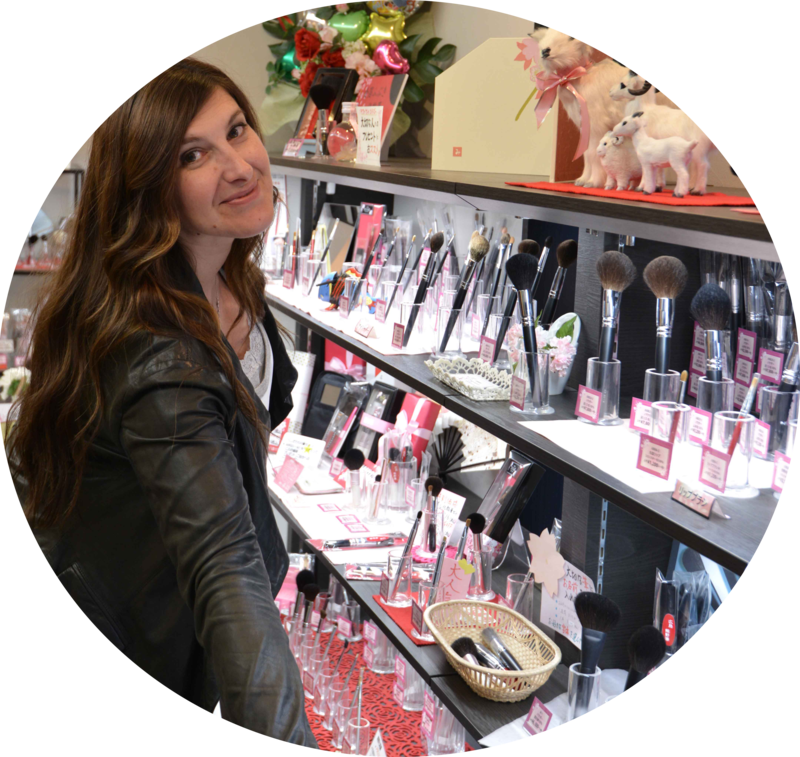 They will certainly be perfect for you since you are a very active and amazing makeup artist, they are efficient, soft yet resilient and would handle a very regular washing and the prices are decent. What not to love ??? and I tend to freeze in front of a camera or in public !!! I am a disaster ! I should try it… just to have a good laugh… 😀 but I sure really deeply appreciate you telling me that you bet I would be great ! Wow! I am so jealous. 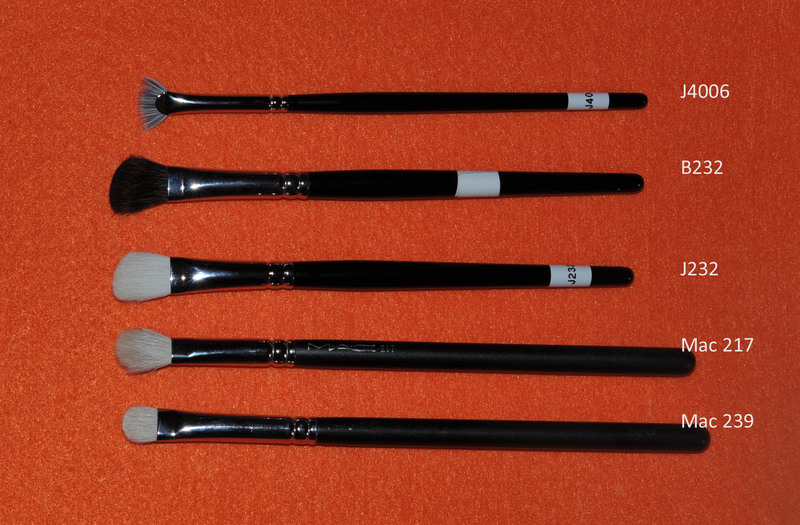 All the brushes look stunning! I have been reading your blog for hours now. I love it 🙂 I found it through a google search on Suqqu brushes (I must say I really, really want the Suqqu Cheek brush, especially after watching Lisa Eldridge’s videos). 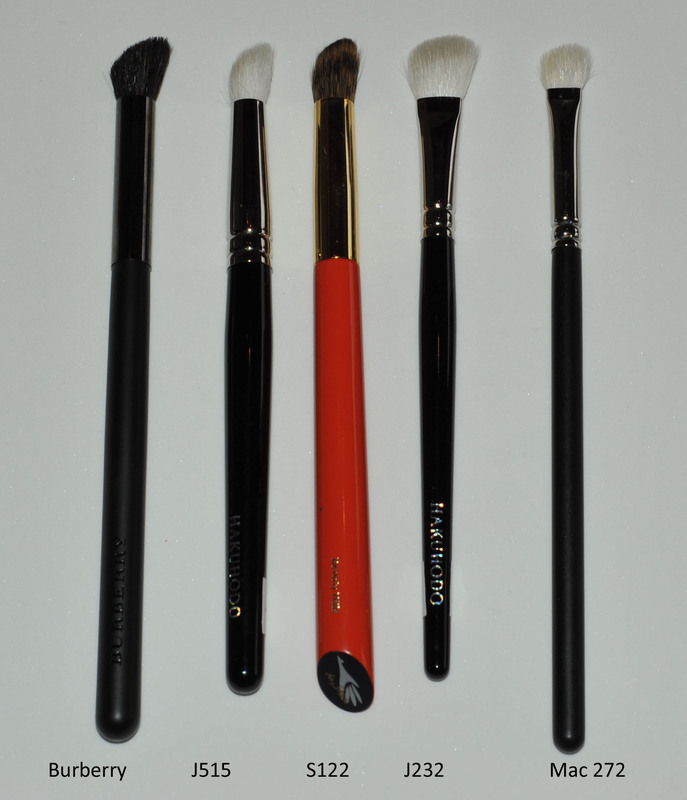 One of my favourite blogposts that you wrote was the current favourite brushes post. 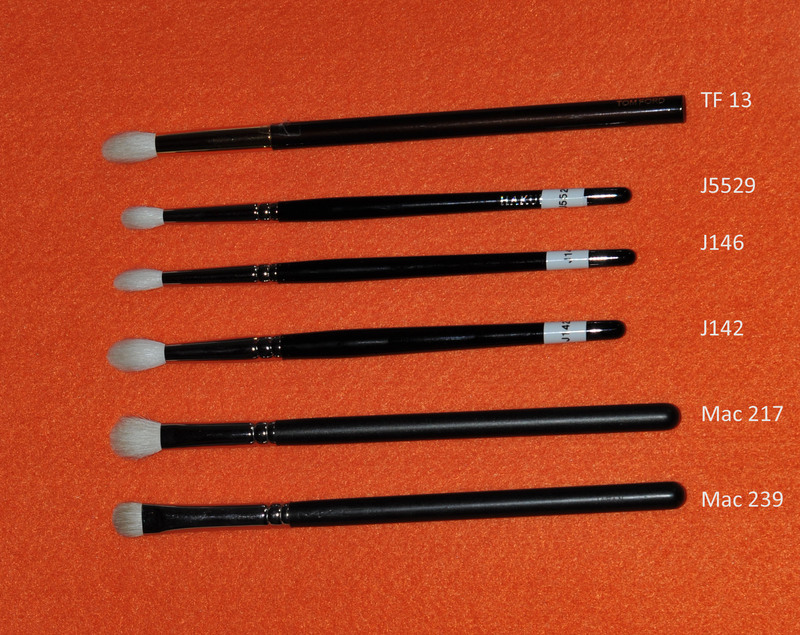 I am guessing that with these new J-series brushes, you will have a few new favourites soon. 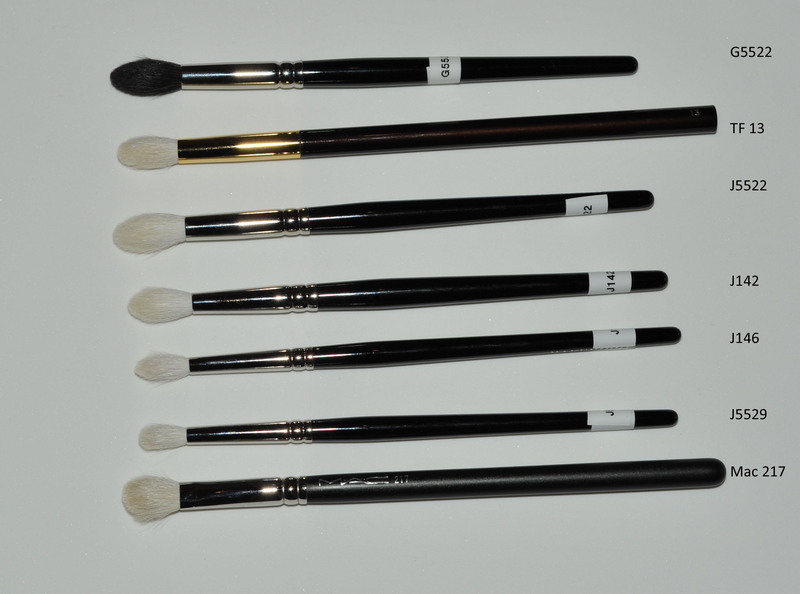 Maybe when you have had them for a while, you could do a post on your favourite brushes from the J-series, and comparing them with other brushes from your collection? Anyways, I just wanted to say I really like your blog. How can I be more happy if you read my blog for hours 😉 thank you !! I have to rewrite a favorite brush post because now I have so many new brushes (Koyudo, Hakuhodo J Series, Chikuhodo, etc…) and it has changed a lot. 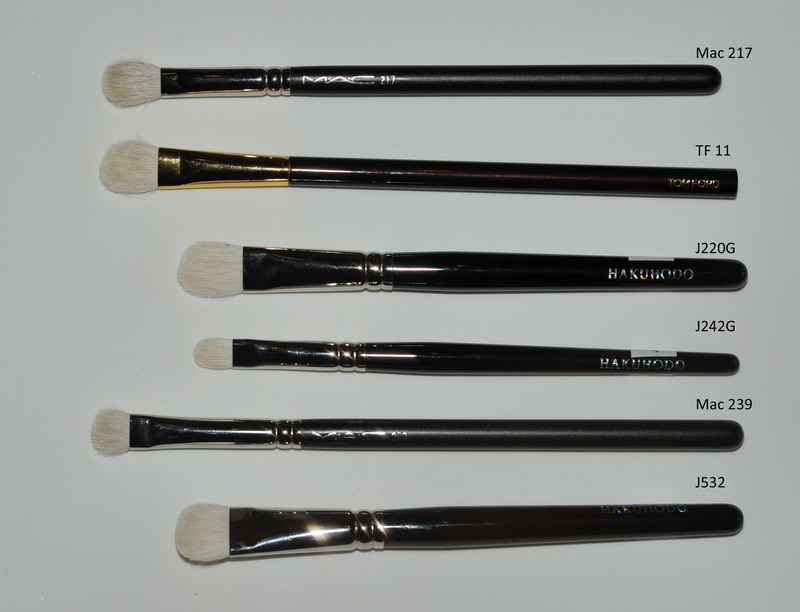 I had to switch my Mac brushes because they became too scratchy for my cheeks and eyes (I was very prone to migranes and couldn’t stand putting my makeup on with those brushes anymore), but I still use the Mac 239 that I consider HG. Actually Hakuhodo has just released a new one, the G5513 and I ordered it this Saturday to see it if that came close to the Mac 239. I still use the LY38 family (LY38 a and b) that are gems. Yes you need the LY20, not because you will use it often, but because of the beauty of it… shame the handle is not more elegant looking because this one is a gorgeous makeup item. Thank you for reading and talk soon ! I’m looking for the J501 on the site and it is not on there. Do you know if they changed the number? One of my most favorite brushes from the j series is the J5522. 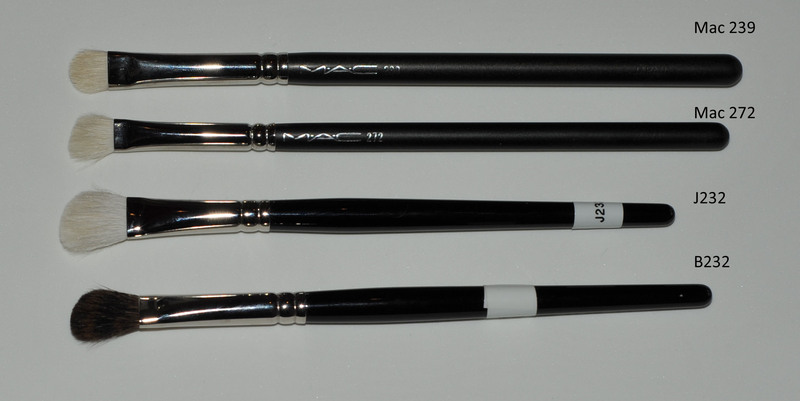 I have 3 of them because it is my holy grail blending brush. (I like it better than my S142). I have the J5523 and of course the MAC 217. I personally prefer the J5523 over the 217 any day, but MY ALL TIME FAVORITE IS the J5522. 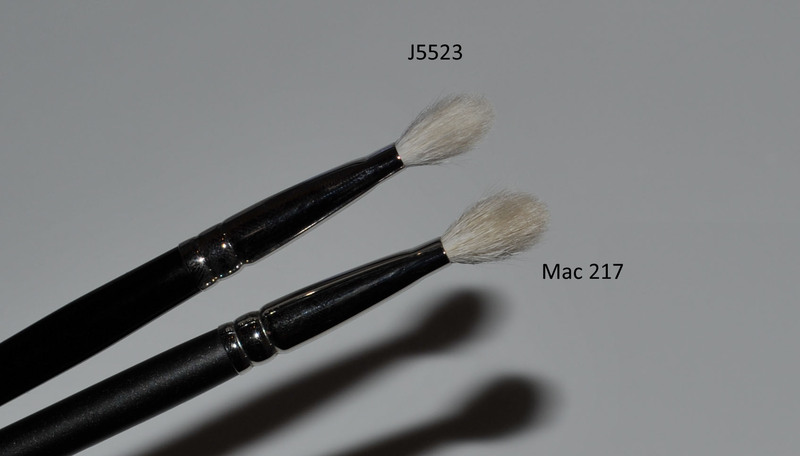 What is your preference between the J5523 and MAC 217. And what are your thoughts on the J5523? 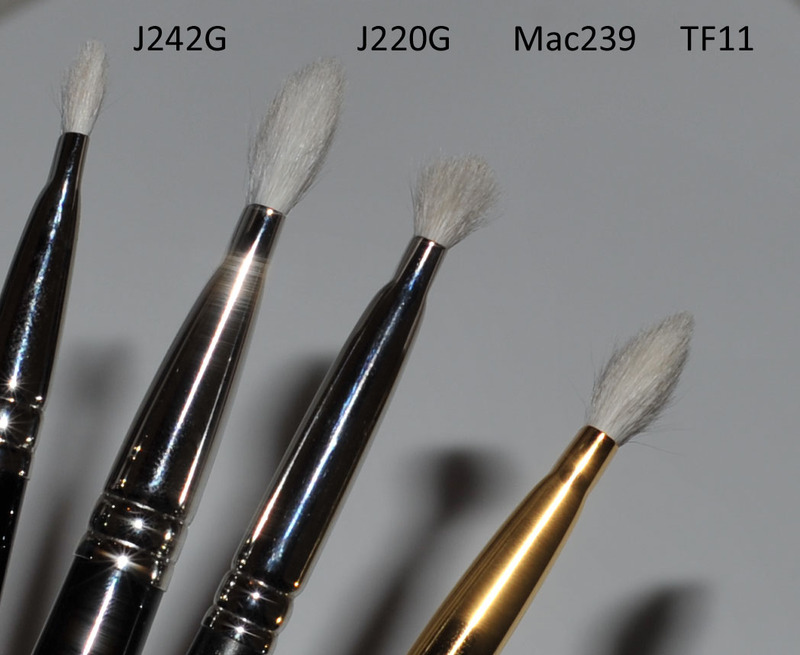 Once you try these series you get hooked 🙂 I am with you, I also love the J5522, it an excellent brush and the price is really good, but I need to pair it with the J146 for example, for those who want a big blender brush they will be 100% satisfied with this J5522. I love both the J5522 and the 217, what I like about the 217 is that it’s firmer so better for more difficult to blend textures. 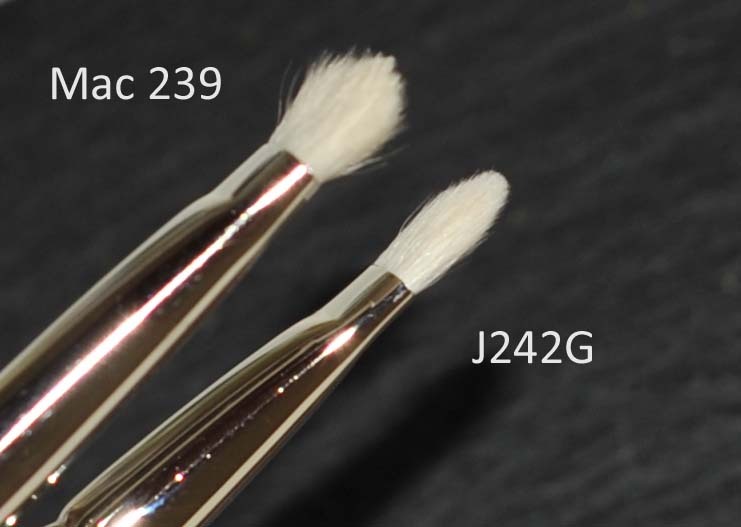 Once you try these series you get hooked I am with you, I also love the J5522, it an excellent brush and the price is really good, but I need to pair it with the J146 for example, for those who want a big blender brush they will be 100% satisfied with this J5522. I love both the J5522 and the 217, what I like about the 217 is that it’s firmer so better for more difficult to blend textures. Not that you need it, but the Tom Ford 13 is probably my favorite and more versatile crease brush : it’s precise, firm, soft, dense and keeps its shape ! 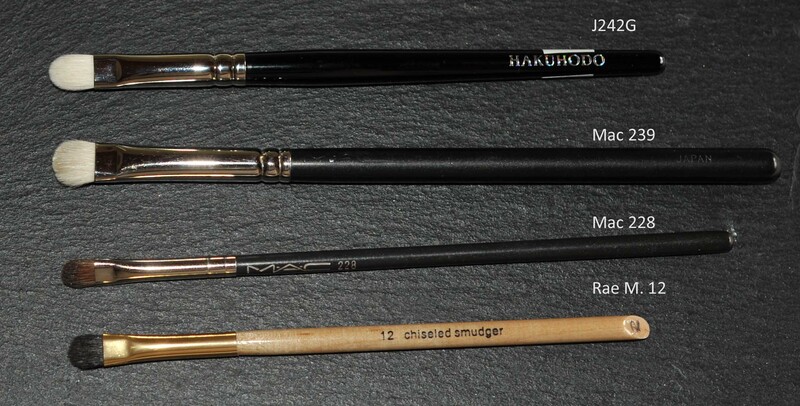 all the qualities I am looking for in a crease-blending brush ! the J146 is a nice small crease brush, if you need smaller than that, the Nars 12 is an excellent (more precise and pointy) option. are you talking about the TF 13? in my opinion it’s worth it, it’s much more versatile and more precise, the J5522 is excellent but a bit too big if you want to define your crease. I could live without this Hakuhodo but I will never let go this TF ! Amazing review!! 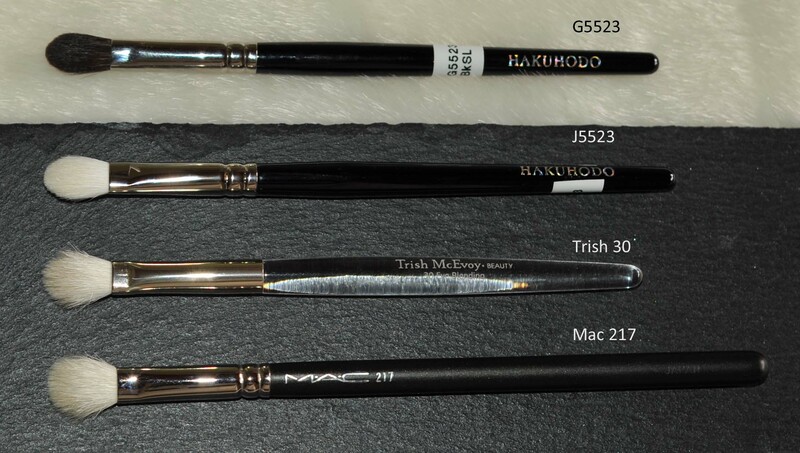 I am about to order two brushes at Hakuhodo: The 210 and the G5521. Now I am not sure whether to take the original black or the J series white versions. 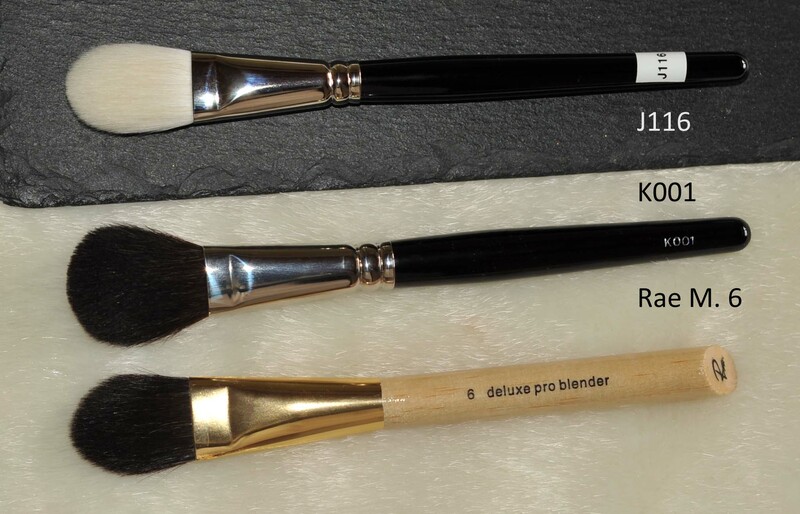 Independently from your personal preferences regarding color, which ones do you think are the better quality brushes? Which ones apply product in a better way? Which maintain their shape? in addition to that… which ones are more multipurpose? the 210 is supposed to be a super multipurpose brush. Does it maintain this characteristic although the britles are much softer with the J version or do the bristles loose control because of the softness? Another thing.. which one do you think is the better highlighter brush? the J/G5521 or the J116? the J5521 has more blending capabilities (good with cream and powder) but the J116 is still dense enough for that, so it’s just a matter of personal preference, if I had to chose one, I’ll get the J5521. 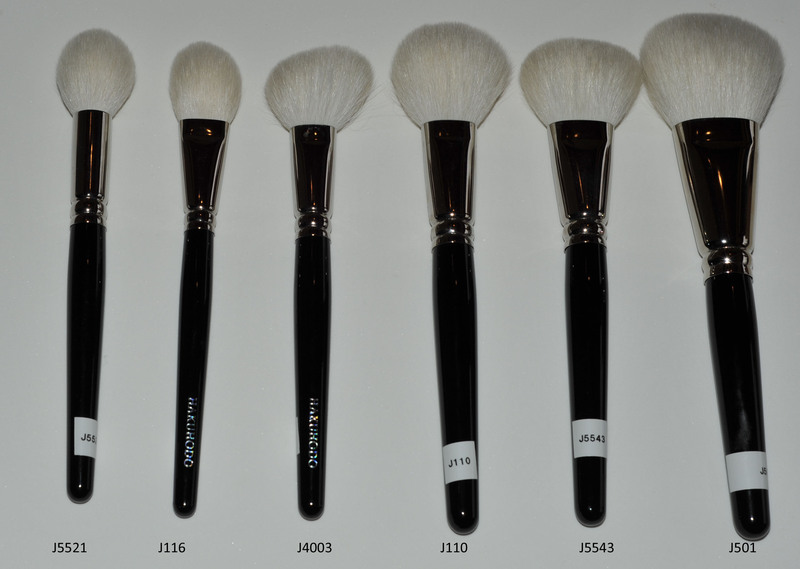 After finding this post, I am SO going on a buying spree for hakuhodo brushes. I’ve been looking for good uality ones and these brushes look like exactly what I need and the price is so affordable! what’s your favorite for bronze? or rather, which one do you think is more beginner friendly when it comes to applying bronze or contouring?? Jay, it depends… are you looking for one in the J Series ? I went ahead and ordered 4 different hakuhodo eyeshadow brushes from the J series (my first hakuhodo ones and I’m so excitedddd!!! 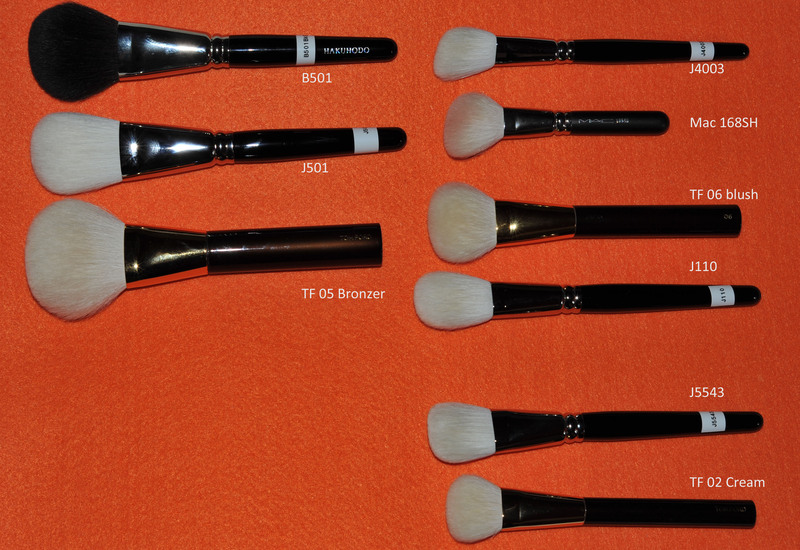 ), but have been going back and forth on the face brushes. I am totally open to more than 1 brush rather than multipurpose, as I know there’s need for more precision with contour (though I rarely do it, to be honest). the J5521 and the 110 seem like good options. I am so glad I found your blog yet I also know I’ll be looking at your posts very often and feeding my lemmings! I’m getting to a point where I have lovely products but feel my tools have not quite been up to par, so hoping to upgrade all of my brushes slowly.